I’ve recently gotten into a phase of matcha madness which sees me craving for matcha in all shapes and forms. I’ve been cafe hopping around Melbourne in search for that perfect matcha latte, researching Japanese cafes for matcha desserts and even savoury matcha dishes like ochazuke (matcha poured over cooked rice with savoury toppings). In recent years as Christmas season approaches, I’d research for the easiest cookie recipes to bake for my family and friends. I don’t consider myself a baker, I’d probably bake just once a year during the festive season, so an easy peasy recipe would definitely be helpful. Given my recent matcha addiction, naturally I’d research for a matcha cookie recipe. What joy when I found a recipe that’s not only super easy, the green cookies would’ve suited the Christmas theme very well too. All I needed next was jolly Christmas songs playing in the background while I bake, because that makes the baking much more fun and memorable! 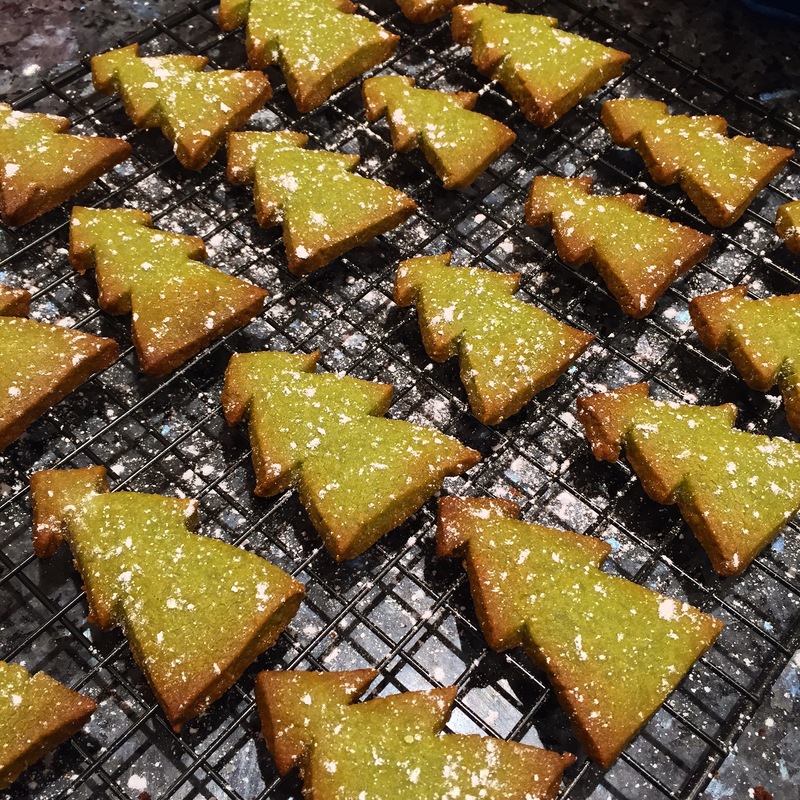 And of course, this matcha shortbread is suitable all year round, not just for Christmas! St Patrick’s Day perhaps? I’ve adapted this recipe from Martha Stewart and since I love matcha so much recently, I increased the matcha dosage which I thought was a good idea. I used Kenko Tea‘s cooking grade matcha powder to make these lovely bites. Sift together the flour, salt and matcha powder then set aside. Cream butter and icing sugar for approximately 4-5 minutes until mixture turns light, pale and fluffy. Add in flour, salt and matcha powder mixture and combine on low speed and continue with your hand to mix until a soft dough is formed. Transfer and roll dough out to 1/4 inch thick on either a clean parchment paper or on cling wrap. Refrigerate dough for 25-30 minutes until firm so it will be easier to handle. 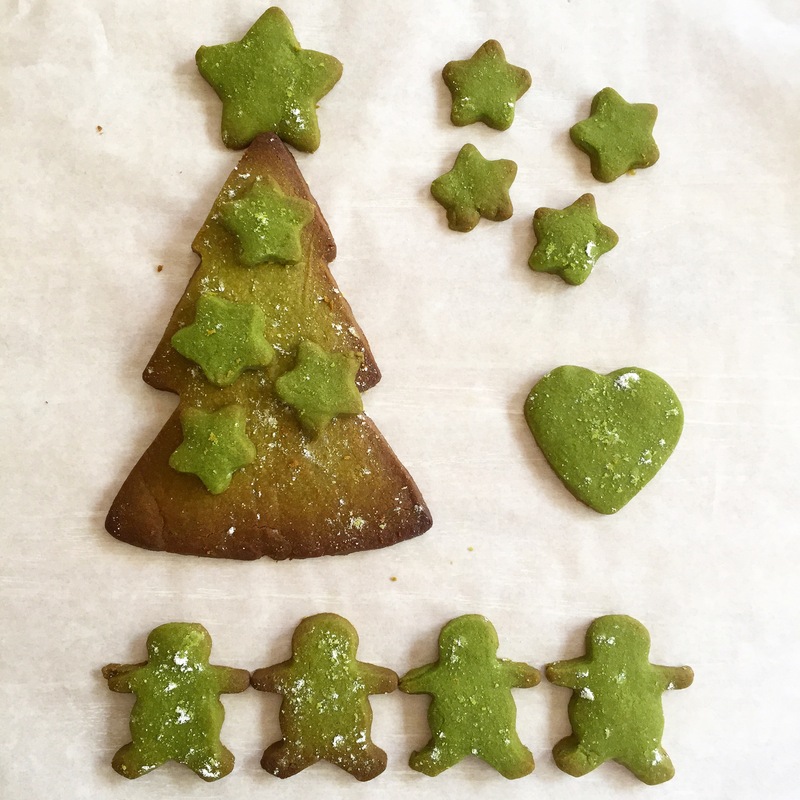 Cut cookies using a christmas tree cookie cutter (or any other shapes) and place them on a lined baking sheet about 1cm apart. Bake for 7 minutes (on fan-forced oven) or until edges are golden brown. Cool on pan for 2-3 minutes then transfer to wire rack to allow to cool completely. It was very encouraging to hear my friends loved the cookies so much that they had gobbled them up in one go. I hope you’ll love them that much as well! I’m sure my matcha madness will not be just a phase. I hope I can continue to bake and explore more matcha goodies. Stay tuned!